The time and energy is takes to paint a portrait by hand is a way of paying concentrated attention to a single person. It is a way of valuing people for who they are, not what they achieve or the money they make. As a painter, I think of it as a performance of the person's intrinsic value as a human being without regard to status; the time required to paint a lawyer or his indigent client is exactly the same. Further, the act of painting a portrait challenges a culture of instant and disposable images. It confronts the highly manipulated advertising images that undermine us all by destabilizing our sense of dignity in order to entice us fill that lack with products purporting to confer status. 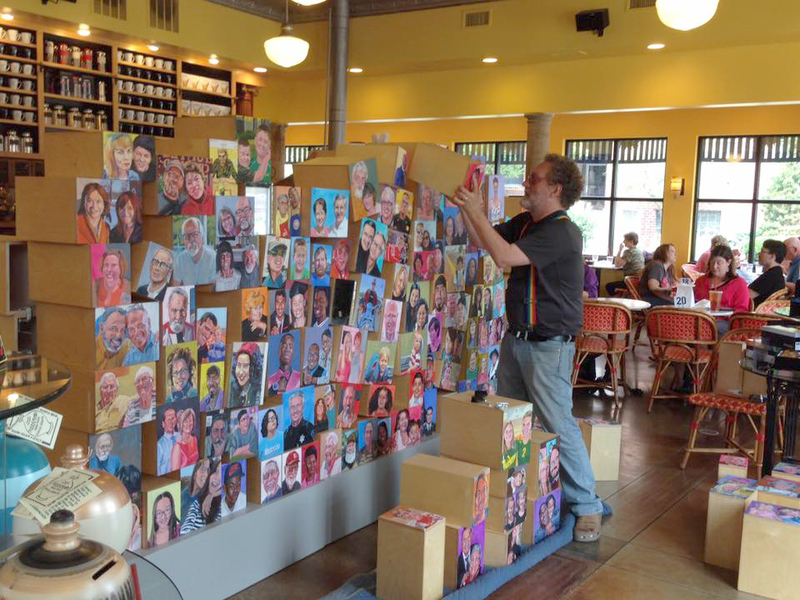 In the Fall '15, as an Artist-in-Residence at Knox College I worked collaboratively with the people of Galesburg to create a community portrait. I prepared for my Galesburg project by making 310 wooden panels which can be stacked into a large arrangement, about 6' x 20'. As it turned out, 406 individuals would be about 1.3% of Galesburg's population. It was my goal to include as many different kinds of people as possible: parents, children, grandparents, roofers, professors, pastors, retail workers, students and teachers, people living in nursing homes, country clubs, and trailer parks, people who are like you and as well as people who aren't. Individuals acquire identities though the networks they inhabit. Representing the networks which constitute organizations, communities and towns required me to collaborate with hundreds of people who emailed me photos. I used pull tag flyers and radio interviews, met with groups and individuals to solicit images. The project needed to have enough of the networks that comprise Galesburg so that people viewing the final project would respond, "Yes, That's my town." The Project's paintings had an aura that went well beyond their objecthood. 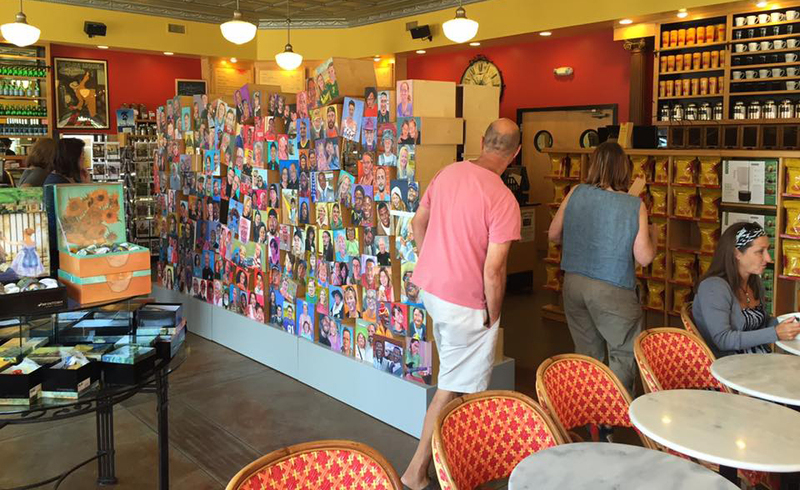 The process of collecting images catalyzed conversations across Galesburg. 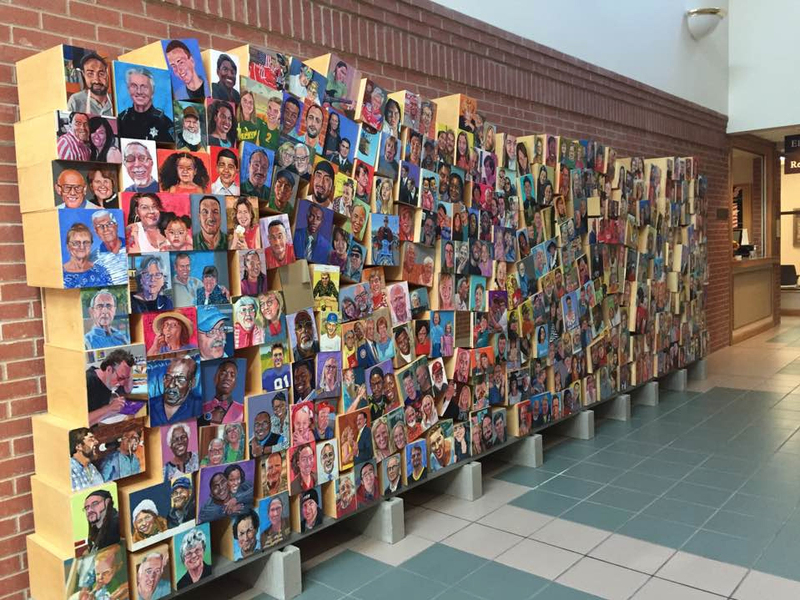 The Project has been traveling between galleries, local businesses, schools and the public library moved by volunteers whose paths would not have crossed except for the their participation in the Project. The project also lives on Facebook where bios of 406 individuals were posted daily from February through December of 2016. When it was installed at a local coffee shop, the Facebook page had 11,286 views. The residency program is made possible by Blick Art Materials. 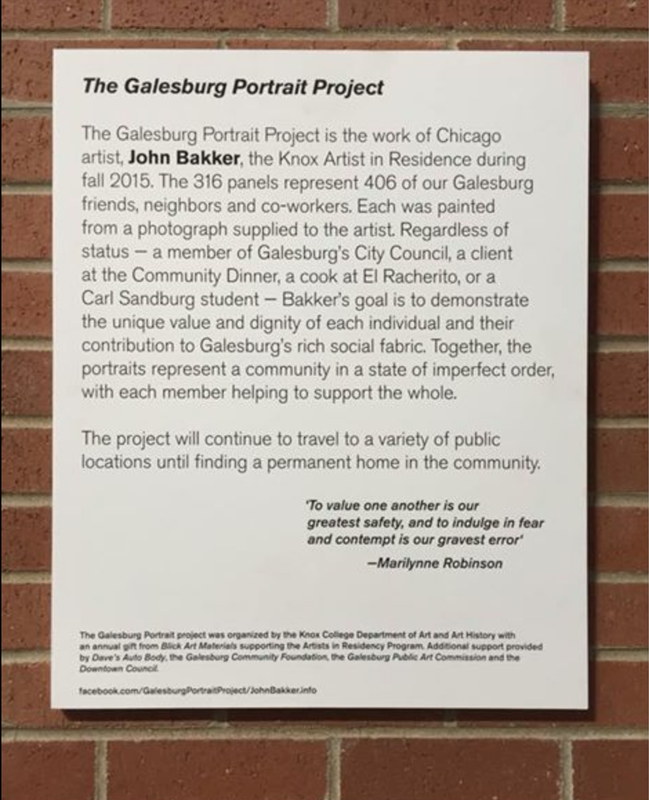 Additional support for this portrait project was provided by the Galesburg Public Art Commission and the Galesburg Downtown Council (among others to be identified later). 1. Here's a link to video from the WKQC's news coverage about the opening of the project. 2. I posted a portrait of each individual daily between February and December, 2016. Click here: Facebook page.